Got a leak in your plumbing? Is your upstairs five degrees colder than your downstairs? Want to install a home entertainment system, wires in the wall and all? Just search for advice on Google, watch a YouTube video, run out to the building supply superstore for the right parts, and take care of it yourself. Expensive plumber, electrician, or HVAC technician—averted. The DIY (do-it-yourself) concept has been around for a long time, but today it’s a huge and growing trend; in fact, Entrepreneur magazine called Millennials—the generation born between 1980 and 2000—the ‘DIY generation’. 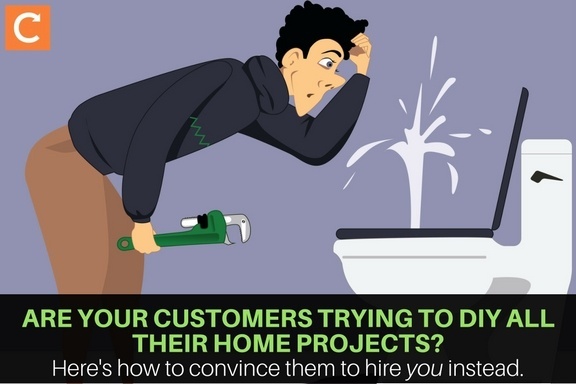 The fact that people can easily find instructions online on everything from unclogging a toilet to building a deck can keep them from calling in field service businesses like yours. How can you convince people to call you for jobs, when they’re certain they can save money (and maybe even have fun) doing it themselves? DON’T go overboard with scare tactics. DON’T compare yourself to cheap options. DO share DIY horror stories. DO steal our infographic on the top 6 most-regretted DIY home projects. DO give customers an experience. Your customers are smart people, and they can see right through this hype. They’re probably perfectly capable of installing a new light switch, upgrading a faucet, or fixing a sticking door. So don’t risk their trust by claiming they need to hire a pro for every tiny household repair or improvement—save the ‘think of the children!’ speeches for where it really matters. When you see people attempting to DIY their home projects, it’s easy to feel sorry for yourself and complain that the practice is bringing down the income of credentialed field service businesses like yours. But think of it this way: Comparing your highly skilled engineers to DIYers is like comparing trained 5-star chefs with fast-food burger-flippers. Your business doesn’t have anything to fear from people hacking together their own DIY fixes any more than that star chef has to fear from the McDonald’s down the street. That said, sharing news of legit DIY disasters is always fun, and can help convince people to hire you for projects where they’re likely to make a mess of it. Like this ‘Funniest DIY Home Improvement Fails’ video on YouTube, which will make most would-be DIYers think twice about tearing down a ceiling or fixing their own leaky pipes. Search online for terms like ‘DIY plumbing disasters’ and you’ll find plenty of material to include in your social media rotation or your email newsletters. We created this research-based infographic (see below) for field service companies to share with their customers. Feel free to swipe it; just right-click on the image to download it, and click here to download the larger PDF version. Want to tweet it right this instant? Here you go! Email the infographic to customers in your newsletter. Post it on social media like Twitter, your business Facebook page, Instagram, LinkedIn, or even—if you dare—that hotspot for DIYers everywhere, Pinterest. We’re sure you can find even more ways to share this infographic so that your customers will know when they need to call you in. Steven Lavimoniere, owner of Lavimoniere Plumbing Heating & Air LLC, boasts over 30 million views on his YouTube channel, where he offers tips on projects like repairing toilet flanges, and videos of himself completing complex projects like installing a gas boiler. But wait! Lavimoniere is a plumber who makes money, well, doing plumbing! Why would he share the secrets of his profession with laypeople? If people are going to DIY their easy home repairs, you can complain about it, you can try to scare people from doing it—or you can give them advice so they see you as an expert who knows their stuff. When they do have a need for a pro, who will they call—the plumber who rants about DIYers, or the one who shows off his skills helping others? Of course, you don’t need to teach customers how to install a gas range or isolate faults in an electrical system, but you can share tips on DIY-friendly projects that people are doing anyway. You don’t even need to create the content yourself; even sharing articles like WiseBread’s ‘10 Easy Plumbing Repairs That Don’t Require a Plumber’ can boost your expert status, not to mention build trust and loyalty in your customers. MORE READING: For even more tips on attracting customers, check out ‘Here's How to Handle Bad Reviews—And Turn Haters Into Customers’. In ‘5 Marketing Tips for Reaching the DIY Generation’, Entrepreneur magazine points out that ‘DIY millennials crave experiences over tangible items.’ Honor that craving among this huge group of potential customers—by, say, helping them learn some simple repairs—and you’ll be the one they think of when they need to hire a professional. Just as your customers needs professionals, you need professional tools. To find out how Commusoft’s field service management solutions can help you become more efficient, more effective—and more profitable—click below to see a 15-minute demo.